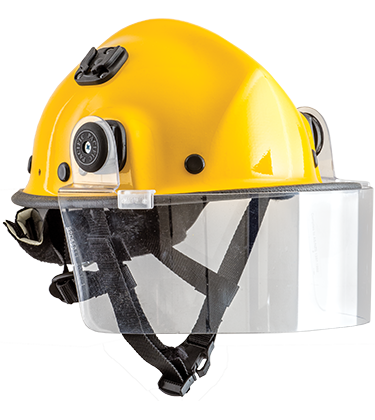 The Pacific BR5 is the heritage model of the Pacific Helmets wildland firefighting helmet range, with a classic firefighting helmet design. The BR5 series offers a range of shell shapes so that the helmet can truly be fit for purpose. These shapes include a 360° wide brim, front peak with rear brim and front peak only (cap style). All 3 styles are certified to AS/NZS 1801:1997 TYPE 3. Each shell shape variant is available with a torch pod built in to the shell which is compatible with the Underwater Kinetic AA series of flashlight. A range of lighting accessories are also available and can simply be affixed with straps and clips. The BR5 MKII allows for either a clip-on or fixed face shield. 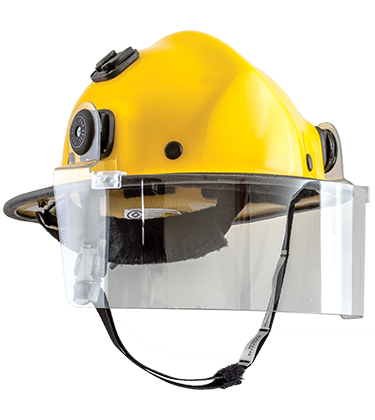 Face shield options can be clear polycarbonate or mesh. Further options for accessory attachments include ear muff clips, goggle clips and straps, a range of neck protectors, and boom microphone and speaker compatibility. Find out more below about the different models.